So Pinterest. I love you and hate you at the same time. There are SO MANY THINGS that I want to re-create and I don’t have enough time in my life to do so. Also, I sometimes question how good some of these pins will turn out…. Will my craft be as cute? Will my kitchen creations come out as beautiful as they do in the photos? Sometimes yes, sometimes no. This one was a 98% yes, with 2% of it being my fault and putting too much in the pan. I’ll explain later. So I saw this recipe pinned a trillion times on Pinterest all leading back to Just a Taste. Doesn’t it look AMAZE? Yeah, it does. So I pinned it along with about 30 others. I usually forget about my pins after pinning, but not this one. This one was stuck in my head. I think I even dreamed about it. I had to do something about it, so I did. I bought everything I needed because, let’s be honest here, I don’t do a lot of bread baking. I buy my doughs pre-made for pizza or I support a local bakery. Perhaps this will change my tune. I may or may not have scoured the grocery store for yeast because … I’ve never bought yeast. BUT! I found it! All was well in my world and it was fine. In the bowl of a stand mixer, stir together 2 cups of the flour with the sugar, salt and yeast. Set aside. In a small saucepan, combine the milk and 6 tablespoons butter over low heat until melted. Remove the saucepan from the stove and stir in the water. Let set until it reaches 120-130ºF. Pour the milk mixture over the dry ingredients, using a spatula to fold them together just until combined. 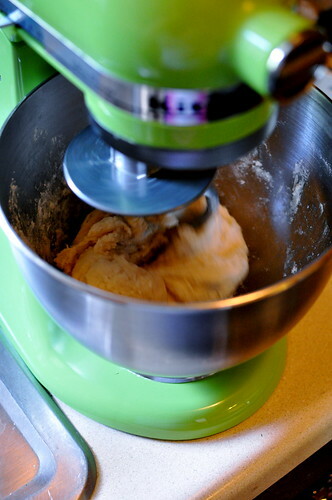 Attach the dough hook to your stand mixer and knead the dough on low speed until fully incorporated, about 3 minutes. 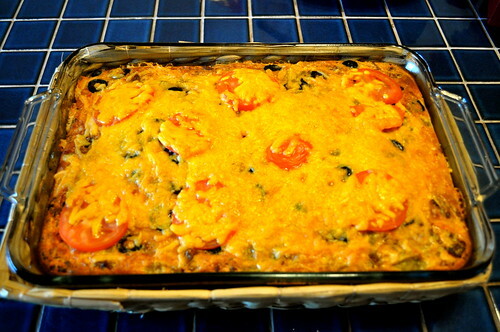 Add the eggs, one at a time, kneading in between each addition so that the eggs are fully incorporated. Stop the mixer and add 1/2 cup of the remaining flour, kneading it on low speed until the dough is smooth, about 2 minutes. Add 3 more tablespoons flour and knead just until the dough is soft, but still slightly sticky. Lightly flour your work surface, and then turn the dough out onto the surface, kneading it 5 or 6 times just until it comes together into a ball. Lightly grease a large bowl. 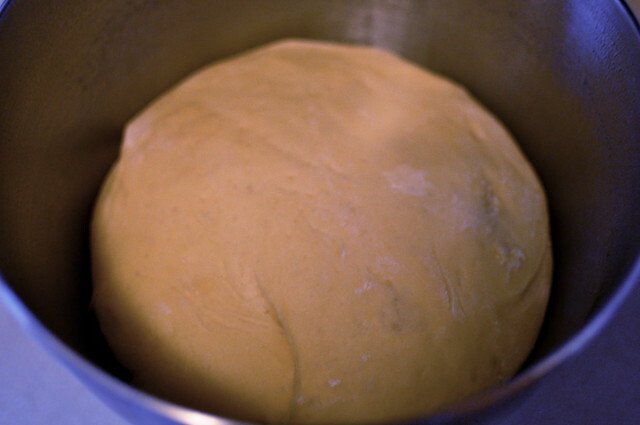 Place the dough in the bowl and secure it tightly with plastic wrap. Allow the dough to proof in a warm, dry place for one hour, or until it doubles in size. 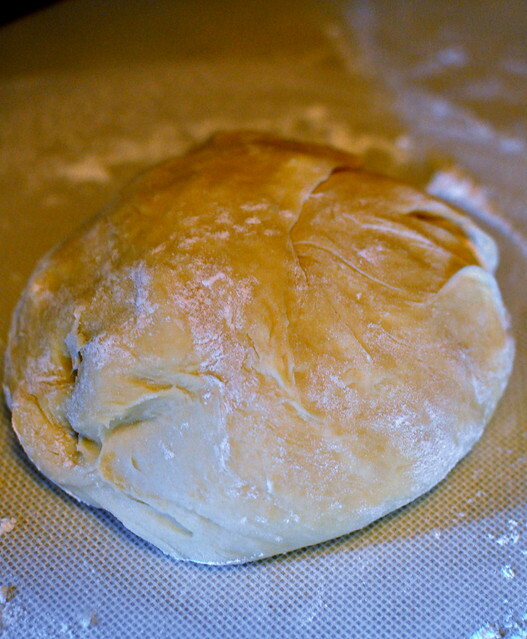 Gently deflate the dough and turn it out onto a lightly floured work surface. Roll it into a rectangle measuring roughly 20″x11″. 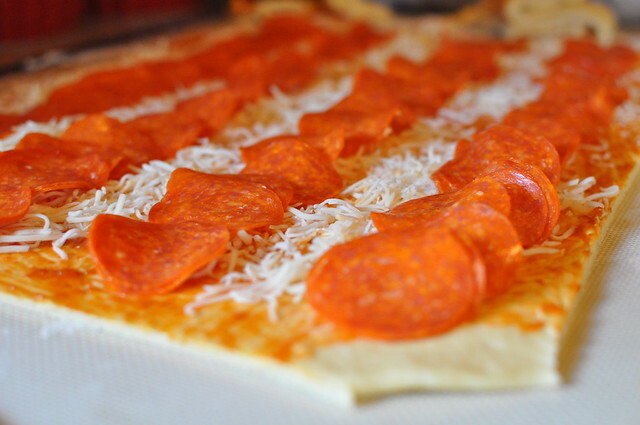 Brush the dough with the sauce, sprinkle it with the cheese and top it with the pepperoni. Trim the edges, discarding any scraps, to make straight sides along the rectangle. Cut the rectangle (width-wise) into 5 equal strips. Stack the strips atop one another and then cut the strips into 4 equal parts to make a total of 20 squares. Lightly butter a 9″x5″ loaf pan. Stack the squares against each other, cut-sides down. (There will be extra space on both sides.) Lightly cover the pan with plastic wrap and let it proof for 30 minutes or until it doubles in size. Stir together the melted butter and minced garlic. Place the loaf pan on a baking sheet and bake it for 15 minutes. Remove the pan from the oven, brush the top of the loaf with the garlic butter, and then return it to the oven to continue baking for 15 to 20 minutes, or until the top is golden brown. Remove the pan from the oven and let it rest for 10 minutes before turning the loaf out onto a serving plate. Here’s where I went wrong. I put TOO MANY squares of dough in my baking dish. I probably should have put about half in. I ended up leaving the bread in the oven for probably another hour. I KNOW. Totally my fault. But it was still delish! See?! Doesn’t it still look amazing? It did. And it tasted delish. I’m making this again. Next time I’ll do a sweet version… can we say nutella? I die. Thanksgiving this year ended up at our place. I was kinda excited, kinda scared, kinda nervous, kind of YESS all at the same time. I like to cook and host so of course I was excited. 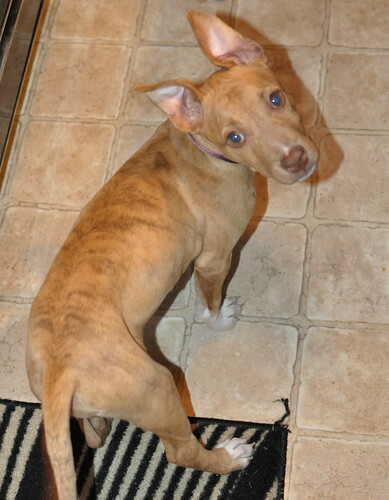 I was responsible for the turkey so I was freaking out. We decided to FRY the turkey, so i was scared/nervous the house was going to burn down. But there’s only one way to tackle those fears, right? By DOING IT. First off, the fryer. We bought a turkey fryer. At first I thought to myself OMG WHY but then I read a user review saying it can double as beer making tools. I immediately added that to my cart and bought it. 🙂 So, expect some big beer posts at some point. I bought a bird which was more of a mind game than anything. I looked for the “perfect” sized bird, which took way too long in my opinion, so I gave up and took the one that was in my cart. Which, really, was fine. Now, frying. I asked a few friends for some tips. Between this website and the directions that came with the fryer, we was set. Another tip. When buying peanut oil, do some price comparison. I ended up getting the best deal at Home Depot. Three gallons of peanut oil for $31 and some change (including tax). Take that, Giant Eagle, and your $19.99/gallon price!!!! My bird, Patrice, seasoned up and ready to take a swim in some peanut oil. Patrice was also THAWED and DRIED completely. I can’t stress that enough. Water and hot oil do NOT mix well. Trust me. When it came to dunking the bird in the hot, hot oil, I was scared. I can’t lie. You really can screw this up if you’re not careful or paying attention. So I made sure I was doing extra of both. Lower the bird S-L-O-W-L-Y into the oil so you don’t create an overflow and then everything goes to hell in a hand basket and catches on fire. This is what success in process looks like. Rule of thumb is 3~3.5 minutes per pound, so that put us around 45 minutes. 45 minutes later, a delicious looking bird. And then this 15 minutes later. My sister brought the sides and pies and we had a quaint Thanksgiving dinner! Mom showed up just in time to get a sampling of everything before we all scarfed it down. The sides were amazing as usual and the fried turkey turned out delicious. Looks like we’ll be having that at holiday dinners from now on! Brad doesn’t cook very often. And when I say doesn’t cook very often, I mean he gets yelled at when he steps foot in my kitchen. 🙂 There is one thing that he has made for me and that is his beloved cheese bread. 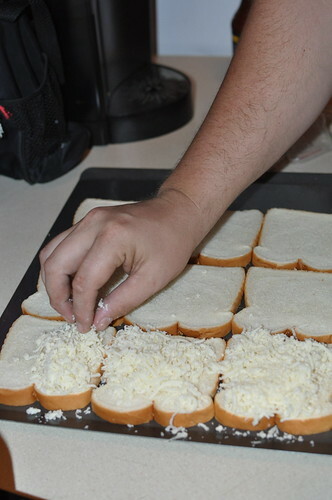 Brad’s Cheese Bread consists of white bread and shredded mozzarella cheese. 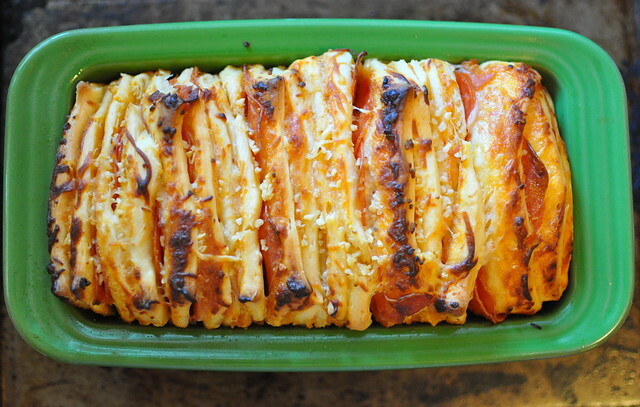 Turn your broiler on, slap bread on a pan, cover it with cheese, and toss under the broiler for 3-4 minutes. The Kitchen Hoover, Olive. She really likes cheese. The end result. 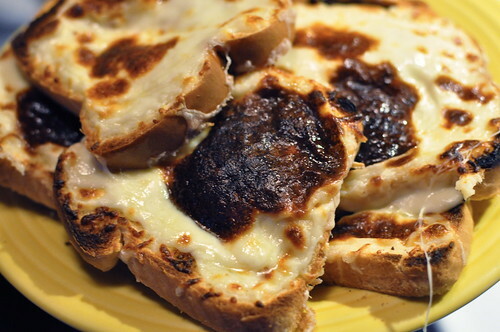 Oooey, gooey, cheese bread. Healthy? Nope. Delish? Yes. At first I thought he was ridiculous for making this but I am secretly hooked. My inner 10 year old loves cheese bread as a side to anything. Or even by itself. 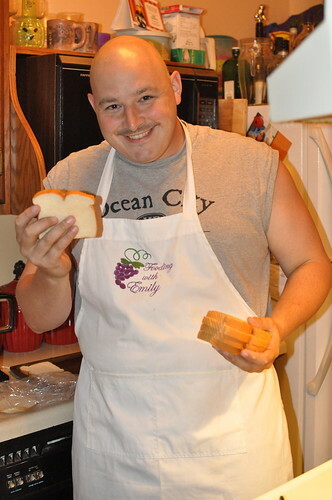 Thank you for your culinary cuisine, Brad! Maybe next time he’ll write the post. 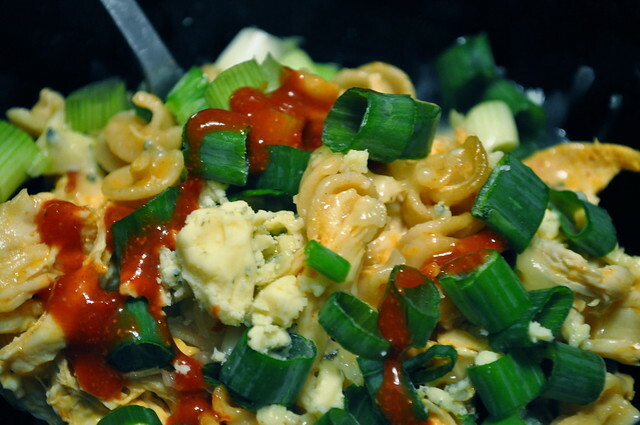 I made this eons ago… and have been craving it lately. And then realized, CRAP! I never blogged this guy! 😦 ALL OF THE SAD. I have found a few variations of this recipe. One at How Sweet Eats and this one that I made over at Can You Stay for Dinner?. This one from Can You Stay for Dinner is a little lighter. Still just as delicious. Stir the milk and cornstarch in a small saucepan. Bring to a boil, reduce the heat to a simmer. Stir in the butter. When the sauce is thick enough to coat the back of a spoon, add the cheddar cheese and stir until the cheese has melted and the mixture is silky and well blended. Place your cooked, drained pasta in a large bowl. Pour the hot sauce over it and stir to combine. In a separate bowl, toss the cooked chicken with the hot sauce, evenly coating and moistening the meat evenly. Use more or less hot sauce depending on your spice preference. Gently stir the chicken into the pasta, followed by the crumbled blue cheese. Serve immediately. 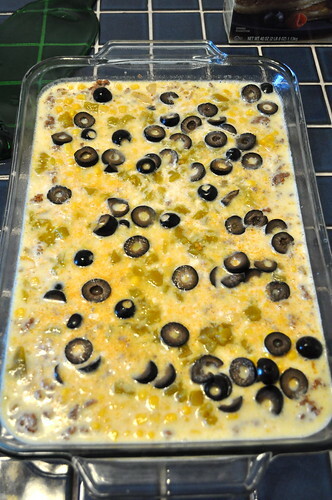 I will be making this recipe again very soon… and will update with a better photo. But you get the gist of it. Om nom nom. I have an obsession with cheese. I can’t help it. Melted, cubed, baked, UGH. 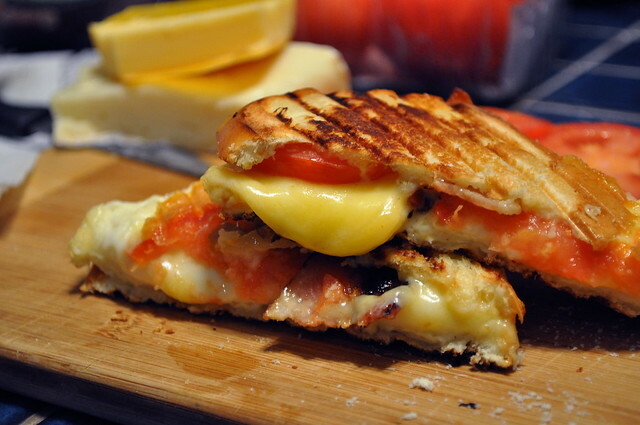 So of course I took a plain ol’ delish grilled cheese and made it a little more sinful. I used gouda and brie as my cheeses of choice. I baked up some apple wood smoked bacon (because bacon is best made in the oven! 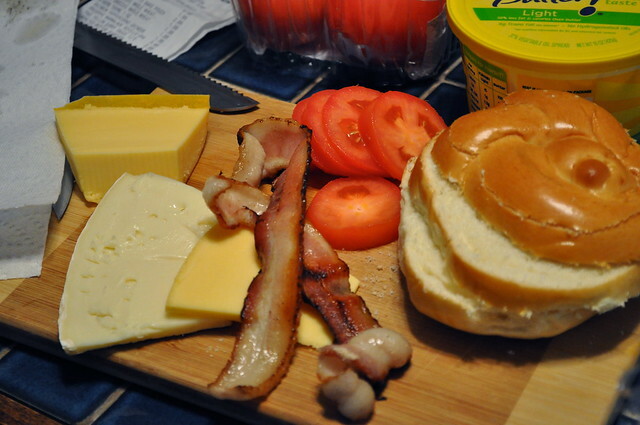 ), sliced some tomatoes and slapped it all between two buttered pieces of challah. I. LOVE. CHEESE.!!! I think I need to join a help group. 6 cups chopped spinach leaves, fresh not frozen! in a large skillet, heat the oil over medium heat. add the garlic and zucchini. cook until the zucchini cooks down. add the spinach and stir until it starts to wilt. stir in the tomatoes, beans and ground pepper. bring to a simmer. 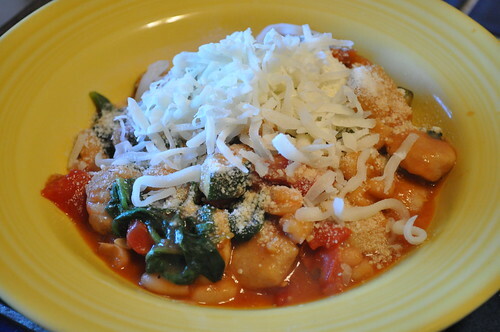 stir in the gnocchi and turn the heat down. simmer for another 5-10 minutes. 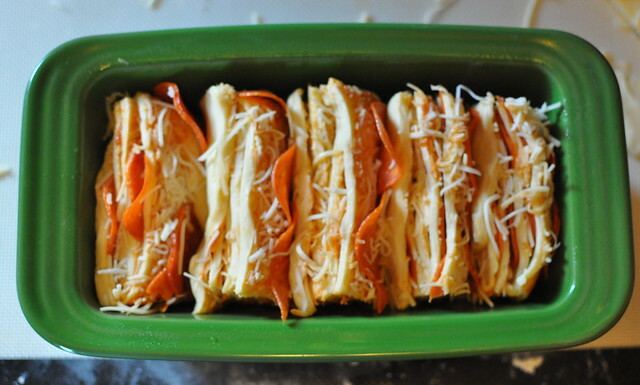 serve with parmesan and mozzarella cheese. i can’t believe how stinking simple this was. and how stinking DELICIOUS. and it’s even better the next day for lunch. i love those kind of meals. and i really enjoyed cooking with spinach. it’s so simple and tasty, i might make it a point to start cooking with it more. i highly recommend this for a quick weeknight meal with some flavor. yum and YUM!